The Schwinn 411 was first introduced towards the end of 2018 as a 2019 elliptical model. It became the new entry level option, pushing the 430 to the middle and making the 470 the new top of the line choice. The most appealing feature of the 411 is its under $500 price tag, making it one of the few ellipticals in the price range with enough features and capabilities to please a wide range of users. If you're in the market for an affordable entry level trainer that won't take up a lot of room in your workout space, this one is definitely worth considering. The Schwinn 411 is all black with red accents like the rest of the lineup, except with a much smaller footprint, making it a better choice for those with limited space in their home gyms. 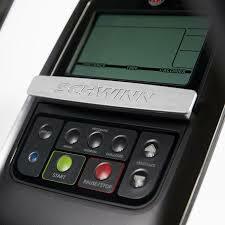 It has a bright backlit display and a user friendly console, with the ability to make changes easily as you work out. Schwinn fans are excited about the all new 411 model, as it incorporates all of the best features of the upper end models in a more compact frame and at a much more affordable price. The parent company, Nautilus Inc, seems to be taking cues from their popular Bowflex Max Trainers, a huge selling cardio machine with a similar small footprint, hoping to create similar success for their Schwinn brand. There seems to be a move towards space-friendly cardio machines these days, as the bulky, immobile treadmills, ellipticals and exercise bikes are being phased out. The Schwinn 411 elliptical gives you 16 levels of resistance to choose from, so there's plenty to challenge yourself with. You can start low and work your way up each time you train, seeing if you can build up to the top levels. You have a total of 13 built in workout programs, including ones that focus on heart rate, interval training (HIIT), challenges, goals and more. So there's plenty of variety there, and more programs than you typically get on a sub $500 elliptical. Interestingly the 411 has wireless heart rate capability, something that the up-level Schwinn 430 currently does not have. It also has Bluetooth workout tracking via the Run Social app, something that is also missing on the 430. So in some ways, this entry level model is better than the more expensive one. Due to the more compact design, you only have an 18" stride, which might not be ideal for taller users but is adequate for most. Very tall individuals might find the elliptical motion a bit uncomfortable. There's a 5.5" LCD display which is streamlined and modern looking, and provides all of the necessary workout feedback like time, distance, calories, heart rate and speed. The other ellipticals in the lineup do provide additional feedback. Foot plates articulate to reduce impact on your knees and joints, you have a water bottle holder and a tablet holder, transport wheels and a 300 lb. maximum weight capacity. So all in all, the Schwinn 411 has a lot to offer for such a small machine. There's plenty to satisfy most casual users, and very little missing. How Does the Schwinn 411 Compare to the Rest of the Company's Ellipticals? As we mentioned above, the Schwinn 411 has a lot of the good features from the other models, making it a good entry level choice. However, there are some things missing that might not make it the ideal choice for you. Let's take a look at all three Schwinn ellipticals to give you a better idea of what each one has to offer. Recapping from above, you have an 18" stride, 16 resistance levels, 13 workout programs, grip and wireless heart rate and Bluetooth workout tracking. 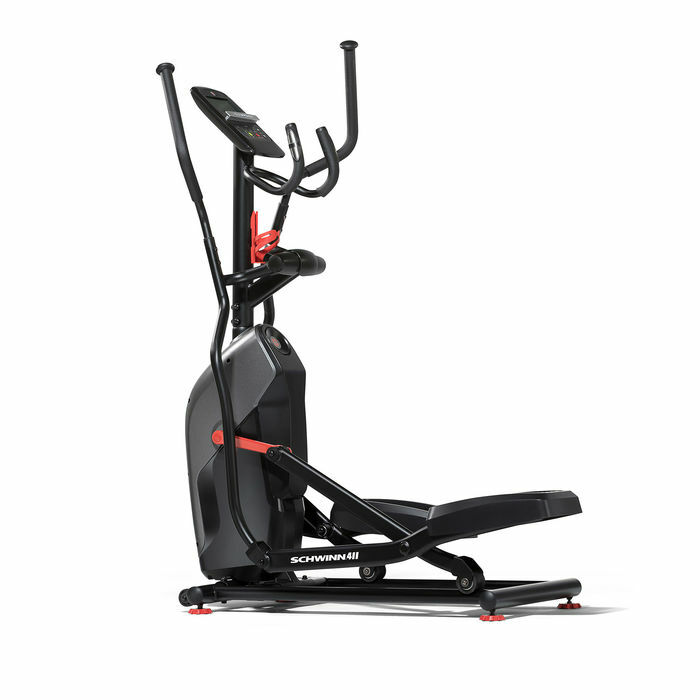 The mid-level 430 is a larger machine with a longer 20" stride, 20 resistance levels, 22 workout programs, grip heart only and no workout tracking. You also get a more advanced console, 10 degrees of manual inline capability, a 3-speed fan, a sound system and a USB Charger. The top of the line model improves upon the 430 with 25 resistance levels, 29 workout programs, grip and wireless heart rate, Bluetooth workout tracking and 10 degrees of power incline. You also get up to 4 user profiles, as opposed to 2 on the 430 and one on the Schwinn 411 elliptical. So as you can see the Schwinn 411 is definitely more of an entry level elliptical trainer than the others, more suited to light use by beginners. The machine only weighs 100 lbs., as opposed to over 160 lbs. like the 430 and 470. If you're looking for a solid entry level treadmill with enough capability to give you a good workout, the new Schwinn 411 is definitely worth a look. There are plenty of workouts to choose from as well as resistance levels, workout tracking and accurate heart rate readings. However, taller/heavier users might be better suited with either the mid-level 430 or top of the line Schwinn 470. Both of those ellipticals are sturdier and larger, with longer 20" strides that you might find more comfortable. Both also offer more workouts to choose from and incline capability for more muscle targeting and a more effective cardio workout. One thing we'd be remiss not to mention is the warranty, which isn't as strong as it could be. You only get 10 years on the frame, which isn't ideal. But keep in mind that this is only a $500 elliptical. You do get a full year on labor here, which is actually better than on the other models. So that's a bonus. Your best bet is to take a look at all three models to decide which one is ideal for your home gym. The 470 is an All Ellipticals favorite, but they all have their particular benefits and drawbacks. The Schwinn 411 is currently on sale! See the popular 411 on sale right now!